Dishes like wild Alaskan pan-seared halibut, served over peas, summer squash, and sweet peppers in a sweet onion purée, show he's more than up to the task. The Henderson restaurant swaps chefs without missing a beat. chef de cuisine Nicholas Ocando. I’m happy to report that the exodus of beloved executive chef Graham Dodds has not affected the quality of the Hibiscus experience. 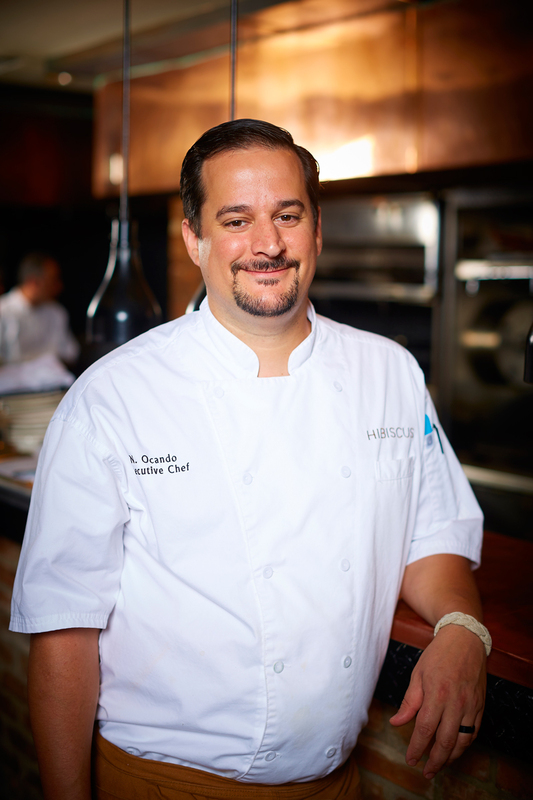 Nicholas Ocando, Dodds’ chef de cuisine, has taken over the kitchen and kept the focus on wood cooking and fine, fresh, and regional ingredients. The temperature outside hovered close to 100 degrees as my friend and I sat back in the dark dining room and nipped a dainty basil gimlet made with Hendrick’s Gin, Thai basil, fresh lime, and a dash of simple syrup. We had a year’s worth of catching up to do, and our server patiently left us to set the pace. Our first pick, burrata cheese surrounded by fresh peaches tossed with pickled ramps and aged balsamic vinegar, disappeared embarrassingly fast. What a glorious and refreshing starter. A lovely piece of pan-seared wild Alaskan halibut, atop peas, summer squash, and sweet peppers in a sweet onion purée, was beautifully presented. I closed my eyes and cherished each bite of flaky fish, which I followed up with a sip of a crisp Austrian Grüner Veltliner. A request for an off-the-menu salad of grilled vegetables and lettuce was an easy ask. An oval plate filled with gently charred tomatoes, broccoli rabe, green garbanzo beans, and caramelized onions was a perfectly satisfying meal for a hot summer night.